No visit to Las Vegas can be complete without a trip to The Stratosphere! This iconic ride is a fixture to the landscape of Vegas and for good reason - built in 1994, this ride provides amazing views of the city and its deserts! Rising 100 floors high, the Stratosphere takes guests up just over 1110 feet in to the sky to an 'observation desk'. 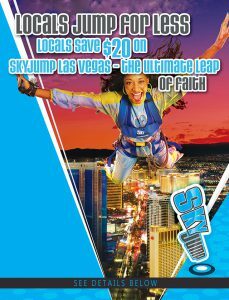 If you're ready for a once in a lifetime thrill, be sure to try out SkyJump Las Vegas - a part of the Stratosphere. As it name suggests, guests can choose to take a 855 foot leap from the top of the Stratosphere at SkyJump - the highest jump in the world - with the assistance of what is touted as a vertical zip line and harnessed cable. Just as you begin to get even remotely close to the ground, you will be slowed down for a gradual and comfortable landing. This might be the biggest thrill of your visit to Vegas! Note to our visitors Stratosphere Tower coupons and specials can change without notice. So please visit their official website to make sure of the latest pricing and coupons.